By Dr Maria C. Khoury, Ed.D. We have just celebrated the Miracle of the Holy Fire in Taybeh in a most magnificent way at the outskirts of our village approximately 5:30 pm local time on this Great and Holy Saturday while waiting all afternoon when this great miracle occurred once again in Jerusalem. The local priests, Fr. Daoud, Fr. Jack and Fr. Aziz, of all three churches and Fr. 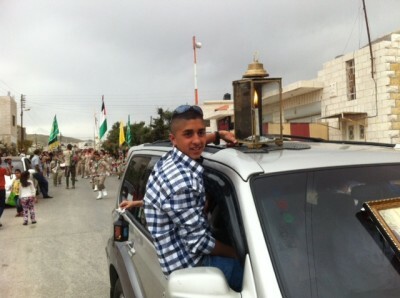 Peter who came from Jerusalem with the choir chanting, and the Taybeh Scouts beating the drums marched again this year to meet our cousin Ibrahim with his son Philip, who went to the city of Ramallah, where the faithful brought the flame from Jerusalem for the Palestinian Christian s who cannot reach the Holy City due to lack of permits. 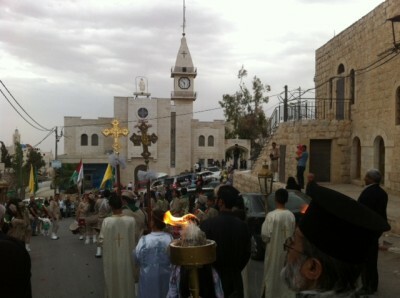 Many residents of Taybeh, were in the streets for the ecumenical procession which was simply glorious although a bit cloudy with a sprinkle of rain. In the last few years during Great and Holy Saturday, I have delivered the same message from the Holy Land. But it has been a great spiritual joy to keep reminding friends about the miracle that appeared for the first time during the Resurrection of our Lord Jesus Christ. (Luke 24:4; Matthew 28:1-4) This magnificent miracle is at the core of our Christian presence in the Holy Land The Miracle of the Holy Fire received today by His Beatitude Theophilos III, Greek Orthodox Patriarch of Jerusalem was broadcasted live on Palestine TV. The brilliant ceremony is considered a miracle because there is no explanation for the way the Holy Fire appears from the Holy Life Giving Tomb of Christ actually coming down from Heaven. Many personal accounts have called the miracle “incredible” and similar to lighting. The Holy Fire at the moment is in flight to many surrounding countries that have less than three hour flights by private transportation including Cyprus, Greece, Russia, Romania. 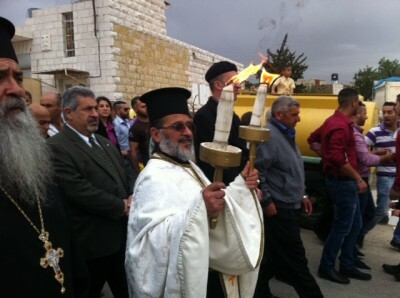 The Christian community in the Holy Land witnessed the True Light of Christ by receiving the Holy Fire today so that all who are not living in the land of Christ’s Holy Resurrection can believe that Christ is “the true Light, which lighteth every man that cometh into the world” (John 1:9). It is so difficult this year to wish everyone a blessed and glorious holy Pascha knowing in Syria the new rules from fanatics is that it is forbidden to wear or display the cross in public. It is forbidden to ring the church bells in public. Also, Christians are asked to pay a tax or convert to Islam; how sad that the new Middle East that America wishes to develop has really gone back one thousand years in history. May our Risen Lord who has had victory over death have mercy on those suffering in different places of the world! May the peace of Christ and the knowledge that our Lord offers everlasting life continue to bring us joy and give us hope. Christ is Risen! Truly He is Risen! Please accept my humble wishes for a glorious Holy Pascha from the Land of Christ’s Holy Resurrection! April 2004 – The entire Christian community in Jerusalem today gathered to witness the greatest of all miracles-the Miracle of the Holy Fire. It was the first time I was not bothered by the soldiers, the police, the large crowds, the noise, the drums of the Boys Scouts and the Girl Scouts anxiously waiting to receive the Holy Fire from the Life Giving Tomb of Christ in the Holy Sepulchre. It was an exciting day where representatives of many churches from all over the Holy Land come to receive the Holy Fire and carry it back in small lanterns to their particular churches for the Midnight Resurrection Service. Palestinians are not allowed to enter Jerusalem without a special permit thus this year many Christian Palestinians went to the extra trouble of getting permits in order to partake in this centuries old celebration that reflects our Christian heritage and deep roots in Palestine . Unfortunately there were three checkpoints inside the Old City so many people, although got a permit to enter Jerusalem , still got stuck outside the church of the Holy Sepulchre. It is on this Great and Holy Saturday that the Holy Fire come down from Heaven and was received by the Greek Orthodox Patriarch as it has been done every year, on the same day, in the same manner, at the same time, at the same holy place of Christ’s Life Giving Tomb. This is the miracle that allows us to know that Christ is in our midst. This is the miracle that allows us to feel that Christ is truly among us. This miracle is another way that God communicates to us. As we chant in our Midnight Resurrection Service: “Come ye and receive light from the unwaning Light, and glorify Christ, Who a rose from the dead”. My son Canaan was very careful to receive the Holy Fire by lighting his candle and keeping it in a lantern until we reached our small village of Taybeh . A wonderful parade was held to celebrate the Holy Fire entering our village. The priests of all three churches, Fr. Daoud, Fr. Raed and Fr. Jack led the faithful with the choir chanting to meet our cousins Ibrahim and Philip who traditionally go to the city of Ramallah to receive the Light from a patriarchate representative who brings it from Jerusalem to Ramallah for all the Palestinian Christian communities that cannot reach the Holy City including not just Taybeh, but Aboud, Birzeit, Jifna and Ein Arik! It is one of the most magnificent celebrations in the Holy Land that has been overshadowed and forgotten during the reoccupation of the Palestinian Territories . For the last three years the boy scouts have not carried on our regular tradition of receiving the Holy Fire to the beat of the drums due to the bloodshed and violence. However, living the cycle of death every day, it was refreshing for the Christian community to rejoice in receiving the Holy Fire and celebrate that for us all hope lies in Christ our Savior. Four years of killing, back and forth, surely we have been living in the darkness of all evil. “An! d the light shineth in darkness; and the darkness comprehended it not” (John 1:5). Thus today we all received the Light that proceeded from the core of the stone that covers Christ’s Life Giving Tomb and once again celebrated the oldest unbroken Christian ceremony that exists in the world. By the way, many people make fun of me for participating in the ceremony of the Holy Fire but since as Christians we are not of this world, I really do not except the world to comprehend the eternal love and presence of God. It takes faith. In Luke 16:15 we read that Jesus said: “Go ye into all the world, and preach the gospel to every creature. He that believeth and is baptized shall be saved” We witness the truth and received the Holy Fire today so that all who are not blessed to live in the land of Christ’s Holy Resurrection can believe that Christ is the true Light, which lighteth every man that cometh into the world (John 1:9). “And that repentance and remission of sins should be preached in his name among all nations, beginning at Jerusalem . And you are witnesses of these things” (Luke 24:47). Our Christian community is small and diminishing but with God’s help and your prayers can survive the terrible occupation, dreadful checkpoints, the collapsed economy, the segregation wall that is currently going up and the daily hardships that make life unbearable. Truly the Lord is Risen! Maria (Kouremenou) Khoury is the author of Orthodox Christian children’s books including Christina Goes to the Holy Land walking the footsteps of Christ. She is a graduate of Hellenic College (1982), Harvard University (1985) and Boston University (1992) with a doctor of education degree. Born in Tripoli, Greece, she was raised in Denver, Colorado. On Dec 31, 2009 she was included on the top 4 Human Rights Champions list by DC Human Rights Examiner including the Ecumenical Patriarch Bartholomew. Maria is the author of Witness in the Holy Land (distributed by http://www.HolyCrossBookstore.com), a publication reflecting personal experiences living under military occupation with her husband the former Mayor of Taybeh, David Canaan Khoury and three children Elena, Canaan, and Constantine. Her articles have been published world-wide in numerous newspapers and magazines and have been translated to various languages bringing awareness of the Christian presence in the Holy Land. Maria was born in Tripoli, Greece and raised in Denver, Colorado. She is the mother of three adult children Elena, Canaan, Constantine and the author of nine children’s books. Her popular book, Christina Goes to the Holy Land, will help inspire young readers in knowing more about the Christian presence in the land of Christ’s holy birth, crucifixion and resurrection. She divides her time between her homes in Boston and Taybeh, travels throughout the world promoting the Christina Books and making presentations about the dwindling Christian community in Palestine. Maria Khoury was selected one of the top four 2009 Human Rights Champions.